Easom Corporation is a Massachusetts Corporation dedicated to selling and servicing Core Separator® systems in North America. The company President is Dr. Bruce H. Easom (MIT ScD '92) who has been instrumental in the technology's development. 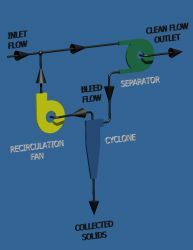 The Core Separator System was invented by Dr. Leo A. Smolensky as an improvement over conventional cyclones to capture fine particles entrained in a gas stream. The technology was improved and refined through a series of research projects funded primarily by the U.S. Department of Energy's National Energy Technology Laboratory. The breakthrough idea of the Core Separator system is that one could use a centrifugal separator, optimized for particle separation, in conjunction with a conventional cyclone to create a system having a particle collection efficiency higher than that of the cyclone alone. An important milestone in the Core Separator system development was the production of a modular arrangement of separators and cyclones that allowed the system to be scaled-up to handle higher gas flows simply by adding additional modules without sacrificing separation efficiency. All steel construction makes system resistant to damage from sparks and fires. The high efficiency separator directs particles to the cyclone for collection. A 2.5 micrometer aerodynamic diameter particle has about a 50 percent collection efficiency in a cyclone. After four passes through the cyclone the capture efficiency becomes 1-0.5⁴ or about 94 percent.